This past February, LHSC's Comfort and Coping Strategy Team and the Pediatric Chronic Pain Program hosted their inaugural Pediatric Pain Conference. To date, this is the fist conference of its' kind in Southwestern Ontario, and the theme was #itdoesnthavetoHurt : Why Pain Management Matters. Held on Feb 1, 2018, this one day conference was designed to create a dialogue in Southwestern Ontario's medical community on why pain assessment and intervention strategies are vital in providing pediatric care. Leading Paediatric pain experts Dr. Christine Chambers and Dr. Stefan Friedrichsdorf provided conference attendees with reasons why YOU, as a health care professional should care about pain. Breakout sessions will create an opportunity for dialogue and hands-on learning opportunities as well as the opportunity to learn what effective, coordinated pain management can look like. Organizers then went on to look at what LHSC's Children's Hospital is doing specifically to address these concerns and improve pediatric care. Who Attended: Physicians, Registered Nurses, Registered Practical Nurses, Child Life Specialists, Residents, Anesthesia Assistants, Medical Imaging Technologists, and all other front line staff who provide care to patients. Dr. Raju Poolacherla is a Pediatric Anesthesiologist with the Pediatric Pain Program, as well as a Department faculty member. As a key organizer and instructor for the Pediatric Pain Conference, his expertise is pediatric pain management was invaluable. The Pediatric Chronic Pain Program is unique to the Children's Hospital, LHSC, and provides assessment, treatment and consultation for children and adolescents who are experiencing chronic pain that is interfering with school, physical activities, family and social functioning. Learn more about the program and the team. The Comfort and Coping Strategy team at Children's Hospital LHSC in London, Ontario has a mandate to design, implement, and evaluate an education curriculum to empower health care professionals with knowledge and skills to enhance comfort and coping, as well as embed practices within the care we provide that is attentive to sensory and emotional experiences of acute and chronic pain. The inaugural Pediatric Pain Conference proved to be a tremendous success. 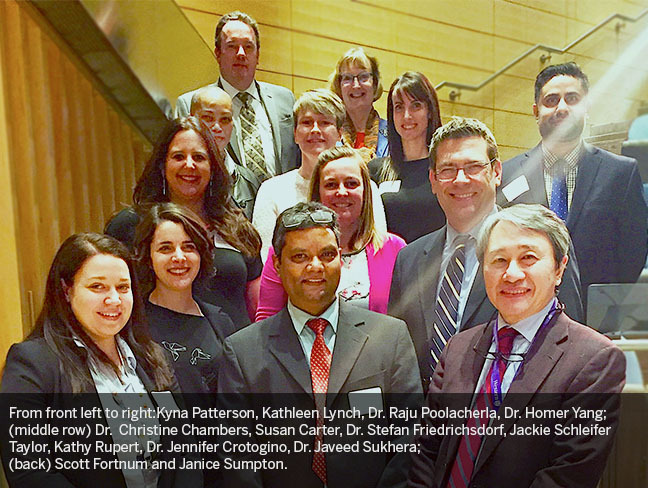 On behalf of the entire Department, we would like to congratulate Dr. Raju Poolacherla and the Pediatric Chronic Pain Team, as well as the Comfort and Coping Strategy team for their tremendous efforts in planning and hosting this conference.